When I tasted through wines from Robert Foley Vineyards at a dinner at BOKX109 in Newton last year, my favorite was the Merlot. The 2006 Claret (a wine made of 100% Cabernet Sauvignon) was a little tight at the time and for immediate consumption I thought the Merlot was drinking much more enjoyably- and cost half as much. With the highly-anticipated 2007 Napa Cabs and Merlots coming to market I was looking forward to trying the new releases from Foley. I was surprised to see the alcohol content on the Merlot: 16.2%! I doubt I'd have guessed the alcohol was so high if I hadn't seen it on the label. I'd consider 14% about average for Napa Cab and Merlot, and 15% the high water mark. I've seen 16% Shiraz and Zinfandel, but never a Merlot this high. Those I shared it with really liked it. One said: This might be the best wine I've ever had. What can I say? America (or at least some part of it) loves the high alcohol wines. Wine Spectator rated this wine 91 points. Robert Parker rated it 95 points. Remarkably bold and flavorful. No way I'd identify this as a Merlot blind. Shiraz maybe. Napa Cab probably. Very big and serious with tons of delicious fruit and a bit of anise. The alcohol was occasionally slightly-searing, but overall the stunningly-high 16.2% alcohol is well concealed. Don't operate a motor vehicle after tasting this one, but quite nice and heartwarming in moderation. Opinions are favorable on CellarTracker with median of 93 from 15 reviews. 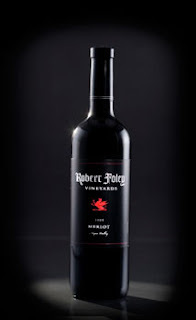 Question of the Day: What do you think of the wines from Robert Foley Vineyards? If there's one thing I want this blog to be about, it's about stretching your wine dollar further than it would otherwise go. I'm a huge fan of luxury for less. For example: Why book a studio hotel room at the Four Seasons for $400 a night when you can rent a villa at the same property via timeshare rental for $250 a night? The difference is in the nuance but to me it's a powerful difference. It's the difference between enjoying a remarkable experience with a great brand vs. a feeling of pretentiousness. More on this here: Your "best available strategy" is "providing remarkable service and an honest human connection". It's the difference between an employee of the firm using flowery unnecessarily stiff words vs. using plain language without going so far as to be sloppy. A relaxing environment can be elegant and when both come together it's exactly what I'm looking for as a consumer. 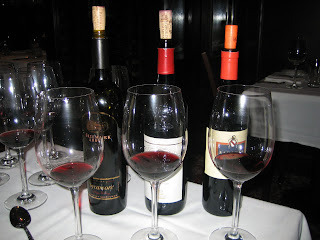 I recently had a chance to check out The Capital Grille's Master Wine Tasting Event at their Boston Newbury Street location. Those of you who know me in real life know I'm a fan of The Capital Grille. And those of you who don't know me in real life may recall this piece I did previously on a Chef's Table we won via a WGBH auction. At the auction dinner I met Capital Grille Newbury Street Managing Partner Christopher Scott. 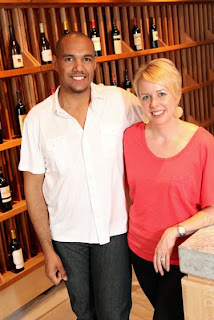 I was thrilled to get a call from him recently inviting me and a guest to come in, have dinner, and taste through the wines offered as part of this summer promotion. The offer provides a chance to taste through up to 10 different wines with your dinner, paired anyway you'd like for $25. I asked our server, also named Chris, how it usually works- do people consider the offer at the beginning of the meal? Is it a hard sell? He said they mention it while a guest is making a reservation so they can think about it ahead of time and not feel like it's a meal-time decision. Very good plan I say- gives you a chance to think about the opportunity before you arrive. The first series runs through July 25th, 2010 and features wines from California, Italy and New Zealand. Starting on July 26th, a second series starts up that features California, Spain and Australia. We started off with a Lunetta Prosecco from Trentino. I thought the notes provided were spot-on for this one: "aromas of apple and peach...crisp fruit flavors...clean finish". A tasty, fruit-forward sparkler to start off the night. Paired nicely with Figs wrapped in Prosciutto with goat cheese and balsamic vinegar. 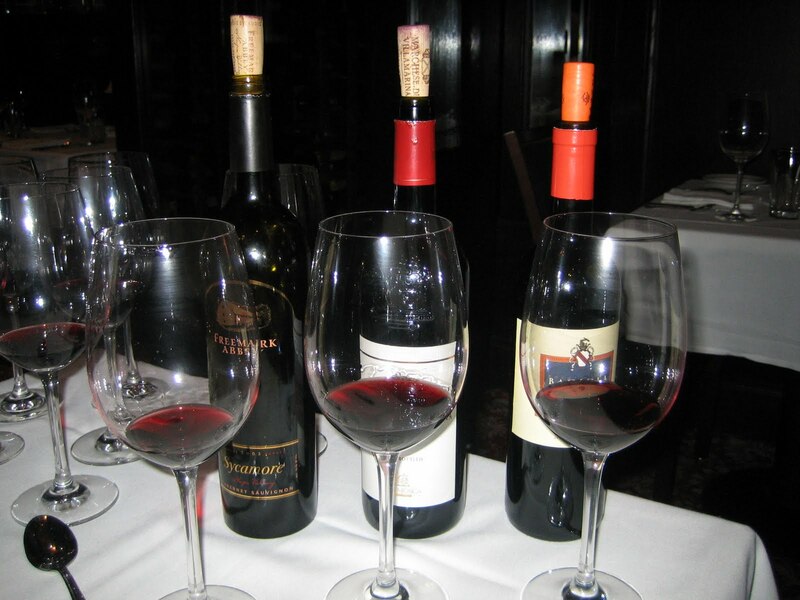 When I go to The Capital Grille, I usually try a couple different wines by the glass given that I find their selections pretty interesting. And their bottles, like most restaurants, are quite expensive. I got to talking to Chris Scott a bit further and asked him to share some tips for navigating metropolitan steakhouse wine lists like those found at restaurants like The Capital Grille. He pointed out their Captain's List which I previously thought included only uber-expensive bottles. There are some very expensive bottles on the list for sure ($1,500 Harlan for example) but there is also a list of bin ends. The list included some favorable pricing on a bottle of 2000 Robert Mondavi Reserve Cab for example (at $85 as compared to a retail release price of $125) and other more obscure selections. That being the case, definitely ask to see the Captain's List in addition to the regular wine list. It's not just for big spenders. Next up came some white wines paired with an always-impressive Capital Grille Cold Seafood Platter. 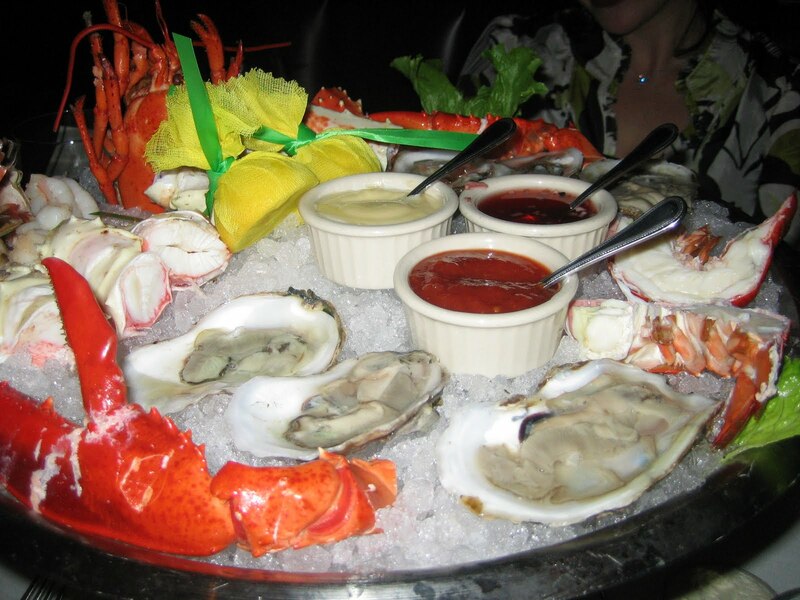 Lobster, Alaskan King Crab, Shrimp, and Blue Point Oysters along with some delicious dipping sauces. The first wine we tried with the seafood was the 2006 Cambria Bench Break Chardonnay. It's described as offering "rich, buttery citrus, peach and nutmeg flavors with a minerality that is seldom found in California Chardonnays". It was definitely a warm-weather California Chardonnay but for my palate didn't go over the top. I thought it paired wonderfully with the shrimp. Next was a 2007 Teruzzi & Puthod Terre di Tufi from Tuscany. It's a blend of Vermentino, Chardonnay and Vernaccia. "Firm acidity and fresh flavors of citrus zest, walnuts and a pleasant touch of toast on the finish". Tasted alongside the California Chardonnay, I was surprised how similar they were. I was expecting the Italian wine to be more austere but I actually tasted a bit of butterscotch on the palate- which I enjoyed. Finally, a 2008/09 Craggy Range Te Muna Road Sauvignon Blanc from Martinborough New Zealand. Less pungent than my New Zealand Sauvignon Blanc benchmark Kim Crawford, I enjoyed its fresh-grapefruit-sweetened-with-just-a-little-sugar flavors. 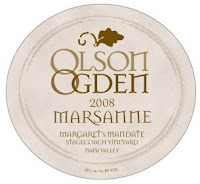 Some oak influence seemed to soften this wine to the point that it was characteristically somewhere between Sauvignon Blanc style you may have had from New Zealand and California. Very approachable. Try it with the Alaskan King Crab and some honey mustard dipping sauce (which sounds like it might overwhelm the seafood but is surprisingly mild). For a salad course we were locked and loaded on The Wedge. With its incredible blue cheese dressing, ripe tomatoes and bacon, it's one of the best salads I've ever had. I was looking forward to trying the lone Pinot Noir of the evening, the 2008 Wild Rock Cupid's Arrow Pinot Noir. Why? Because during the WSET course I took a while back the single most impressive wine I tasted was a Blind Trail Pinot Noir from the same region as the Wild Rock- Central Ottago. Relative to other grape varieties, I drink a lot of Pinot Noir. As compared to domestic Pinot Noir, I'd associate New Zealand Pinot Noir from Central Ottago most similarly with Oregon Pinot Noirs from riper vintages (btw, 2008 Oregon Pinot is supposed to be incredible- read more here). The Wild Rock Pinot didn't disappoint. "dark cherries...plums...spice notes. full-bodied and well balanced with fine tannins" said the description. I noted beautiful red candy fruit without getting too sweet. A little earth and very smooth tannins. Really nice. It was my *wow* wine of the night. Next- a 2006/07 Craggy Range Te Kahu from Hawkes Bay New Zealand. Labeled on the menu as a Merlot, it's a Bordeaux blend. Strawberries. Sour cherries. It definitely behaves more like the new world continent it's sourced from. While approachable and friendly, I would have appreciated more firm tannins on this one. Rounding up this trio was a 2003 Beringer Bancroft Ranch Merlot from Howell Mountain in Napa Valley, California. Menu description: "Ripe, black-fruit...roasted coffee beans". I thought this wine was pretty darn delicious. Mocha came through in a big way. We took a short break from the wines and I had a chance to ask more about The Capital Grille's collection of restaurants and the Newbury Street location in particular. Almost every time I go there, I seem to see a celebrity of some sort. This night there was a table of a half-dozen LA Dodger players. Last time it was Ben Watson from the Patriots. It's popular with Yankees players in particular. "I finally got to my table and the waiter comes over and says. 'The guy over there wants to buy a bottle of wine for you.' I looked over to where he was pointed and it was Wakefield who was smiling and waving to me again. 'Tell him, no thanks, I'd rather have the cash!' I said to the waiter.'" "The waiter" was Managing Partner Chris Scott. He's got dozens of stories like this, but he deals them out with discretion. He's got an ability to maintain a conversation while keeping an eye on their Yelp and Open Table reviews on his iPhone and running the restaurant with all that entails. I showed him we'd checked in on FourSquare and he took note of who the mayor was. He knew him and said he'd say thanks to him the next time he saw him. You've got to cover a lot of space when you're in his position and he does it very well. 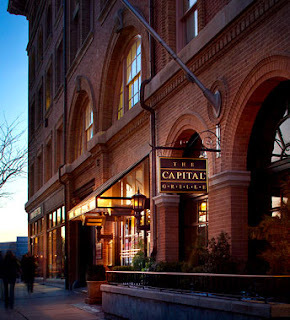 The first Capital Grill was opened by Ned Grace in Providence, RI in 1989. After expansion and a few mergers, with Bugaboo Creek Steak House and Longhorn Steakhouse, the group was formerly publicly traded as RARE Hospitality. In 2007 RARE was acquired by Darden and each of the separate restaurant brands were maintained. There are now over 40 Capital Grille locations in the country. Like the Four Seasons Hotel group, each location is built on a certain set of core values and then they adapt their style just a bit to be align with each locale they serve. 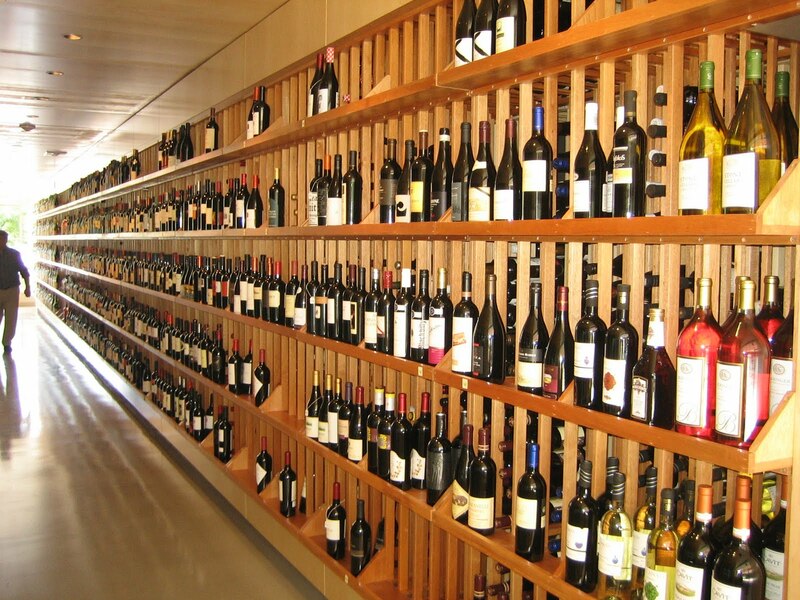 65% of each wine list is consistent nationally but the remaining is selected locally. 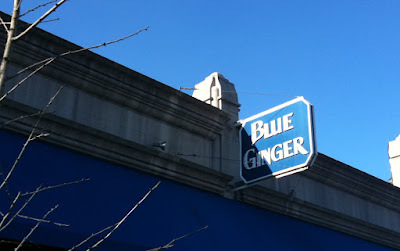 The Newbury Street location opened in 1996 as just the second in the group after Providence and is now a Boston fixture. 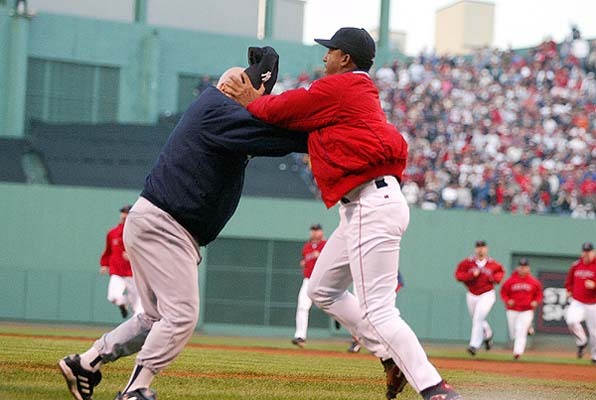 Locals know you can valet park for $16 and grab a quick bite to eat at the bar before a Red Sox game and catch a cab or take the short walk over to Fenway. There are 2 other locations in Boston: Chestnut Hill and Burlington. The Burlington location is open for lunch. Walt Disney used to call the small attention to details that took something from good to great plussing. This tradition continues today in Pixar films in the form of tiny differences that take the animation to the next level. At the Capital Grille they call it value added service. It's the little things they do that make a visit more memorable and enjoyable. Like having your table ready and waiting when you've made a reservation, complete with a little confetti or rose petals if the occasion warrants. The dark cloth napkins when you're offered when wearing dark clothing so you won't get white lint on yourself. Your server passing you a business card (or sending a hand-written thank you like they sometimes do at Nordstrom) at the end of your meal. They work hard to execute these things in such a way that it looks like it comes naturally. But it's got to be a lot of work to consistently deliver this kind of intuitive service. As we migrated from the salad course to the main course, we were presented with 3 reds- 2 from Italy and one from California. First, was a 2003 Freemark Abbey Sycamore from Rutherford, Napa Valley. Description: "Black raspberries and dark cherries wrapped in a milk chocolate coat. This is the benchmark for what great California Cabernets should be." Wow- sounds good. Sounds like it would be right up my alley. My first impression was that some menthol characteristics overwhelmed the straightforward fruit the description alluded to. Our waiter asked how we liked it and I said I was a little underwhelmed so he opened a new bottle (the original bottle we were drinking from was nearly empty). The newly-opened bottle was substantially better, but that menthol was still on the background on the finish. Not a flaw or a bad thing in any way- just not what I was expecting. Next was the 2003 Sella & Mosca Marchese di Villamarina from Sardinia, Italy. This was a Cabernet-based wine with "flavors of vanilla and black currant, soft tannins, and a long, powerful finish." I thought this was an elegant red wine that was definitely old world/Italian in style. It provided a nice contrasting style to the Freemark Abbey and especially the Beringer. Finally, the 2007 Fonterutoli Poggio Alla Badiola from Tuscany, Italy. A Sangiovese/Merlot blend, the description included "flavors of wild blackberries and raspberries with a pleasant earthiness". I thought this one was a little limited aromatically with tart cherry flavors. If you haven't already, I highly recommend you try the Bone-In Kona Crusted Dry Aged Sirloin with Carmelized Shallot Butter. Even if you're a purist who simply likes a well-prepared piece of premium steak, and you're afraid the Kona treatment will be too sweet, you might be surprised with how utterly delicious this steak is. They're willing to prepare other steaks Kona-style but I'd stick with the recommended cut. I've strayed a couple of times and it hasn't paid off. 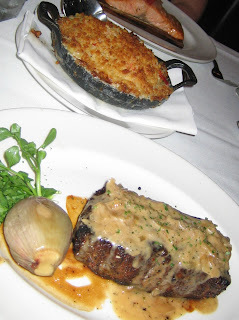 All of the sides were tasty (as I've said before I like The Capital Grille because all of their food tastes so good- not just the steaks) but the Lobster Mac 'n Cheese once again stole the show. So delicious and decadent without getting too heavy. It's hard to stop eating. A side I've enjoyed in the past but didn't get is the Creamed Spinach. A steakhouse staple for sure and they do it up pretty well. One side we've had in the past and didn't care for: Truffle Fries. Nothing special: Skip 'em. Two of my favorite desserts at The Capital Grille are the Flourless Chocolate Espresso Cake and the Coconut Cream Pie. The Espresso Cake is so dense and rich- it's really special. And the Coconut Cream Pie is more of a recent discovery for us but we had it again and it was delightful. It's not just a slice of pie- but rather a 5" round which provides more of the highlight of the dish which for me is the delicious crust. I was stuffed and wanted something lighter so I went with the Fresh Strawberries Captial Grille- basically glazed strawberries over vanilla ice cream. It was OK but I don't think I'd make that choice again. As you can tell I'm a big fan of The Capital Grille, and this was an amazing visit. Not only for the great wines and fantastic meal, but for the chance to learn more about their collection of restaurants and their style of service. This Master Wine Tasting Event provides a great opportunity to try a lot of different wines with your meal at a reasonable price ($25 per person). I've been consistently impressed with their by-the-glass selections and these picks continue a tradition of flavorful wines with broad appeal. Wine drinkers can try some new things and without getting too far off in the wine-geek weeds. Tip: If you want to purchase any of these wines in the Boston area they're available retail at Bauer Wine and Spirits and The Urban Grape. The Urban Grape is a new wine store in Chestnut Hill that just opened. I'll be doing a write-up on them soon. Update: The Capital Grille Boston has moved to a new location on Boylston Street. More on that here. I've been seeing a lot of creative offers rolling in from wine retailers the past couple weeks. I think to myself- what am I supposed to do? Forward this on to my kids and ask them to buy wine for me? I've also seen a number of news articles and blog entries with Father's Day buying guides. All creative and helpful for sure, but what do dads of young kids really want for Father's Day? Especially dads who are wine enthusiasts? I can only answer for myself of course but I thought to offer this approach up for what it's worth. What I'd really like for Father's Day is some unencumbered time to go to a favorite wine shop or two with enthusiastic encouragement from my family to buy some nice wines. That's it. No gift certificates needed to complicate the situation, no tickets to events, no expensive bottles need to be purchased for me. 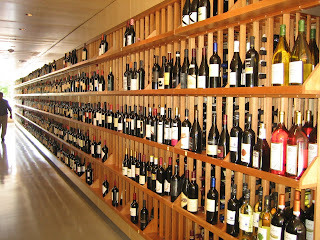 Just some quiet time to peruse my favorite wine shops and pick up a nice bottle or two. Don't get me wrong- I want to see my family on Father's Day for sure. My little guys (5 and 3) are at such a cute stage. And sometimes I really enjoy going to certain wine shops with them. And I don't mean to suggest that I don't get the opportunity to visit wine shops by myself or that my wife begrudges me spending our money on wine. They're all so supportive of my wine hobby and I especially appreciate their enthusiasm and support for the time I spend wine blogging. I just think this would be a nice way to spend a couple hours this weekend. What do you think? 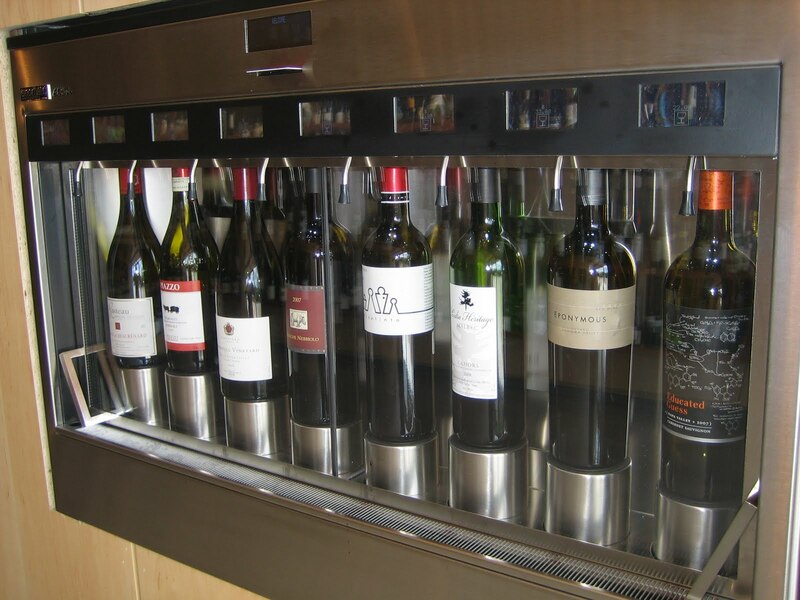 As a Dad who is a wine enthusiast- what do you really want for Father's Day? Blanchards Wine & Spirits is offering a unique educational wine tasting experience this coming Thursday, June 17th. Dr. Dirk Richter of Weingut Max Ferd. Richter will be presenting his wines in the Blanchards Vintage Room from 7:00p-8:30p. I've attended similar events at Blanchard's in the past- I think they're a great deal. You get to try some nice wines and learn more about a specific producer or region directly from an expert from that region. 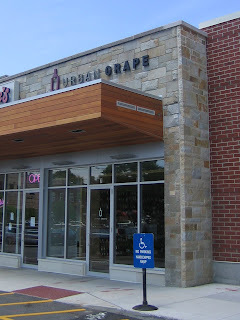 It's a sit-down format in a comfortable setting and the wines presented are usually offered at a discount (along with a 10% off coupon for the entire store). Each time I've gone I've made friends with wine enthusiasts seated nearby. Bonus! I remember a few months back I was kicking around the idea of getting together with some other Boston-area food/wine bloggers and compiling a list of restaurants that allowed you to bring-your-own-bottle of wine to enjoy with dinner. I remember reading somewhere how this would be a bad idea. That to publish a list of restaurants that allow BYOB would be outing law-breaking restaurants and therefore such a list shouldn't be published. They even have an iPhone App and provide an overview of state-by-state BYO legal regulations. Very well done. What a service. 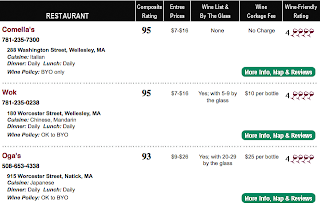 I particularly appreciate the Wine-Friendly Rating as it shows an awareness of recognizing the difference between restaurants that permit BYOB vs. those that enthusiastically embrace it. 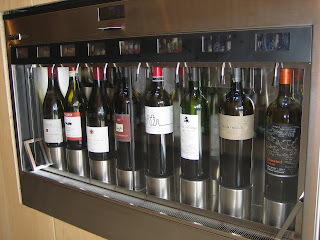 Which reminds me of the excellent Tuesday-only wine program at West On Centre in West Roxbury, MA. We've done a coupe of tasting dinners there and their enthusiasm for wine is outstanding (read about our "Steakhouse Cab" tasting HERE). I found it interesting that GoBYO doesn't have a per-night notion in their system- West On Centre is listed as not permitting BYO- perhaps this is an area for improvement. At any rate, definitely check out GoBYO next time you're seeking a BYO-friendly restaurant near you. Thanks to VinoDivino for the heads-up about GoBYO- it is appreciated. 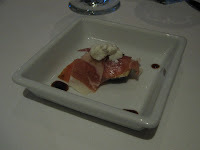 I recently attended a wine dinner at Blue Ginger in Wellesley that featured wines from Oregon. This provided an opportunity to try some highly anticipated 2008 Willamette Valley Pinot Noirs. After a lackluster 2007 vintage, the 2008s are the product of what some are describing as near-perfect growing conditions in the fickle region. Professional ratings are just being released and some of the wines are already available at retail. Head on over to Corkd to read more about the event and these wines.